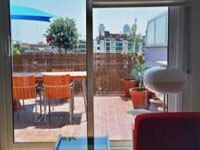 Modern apartment with large furnished terrace. Completely equipped with all mod. cons. including air conditioning, central heating, satellite TV, CD player... Accomodates up to four people. Centrally located, close to Ciutadella Park. Only 15 minutes walk to Ramblas, Sagrada Familia or the beach. Other equipment in house: air conditining, cd player, satellite tv, etc. 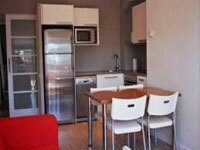 Centrally and safety area, close to the beach and the Ciutadella Park.